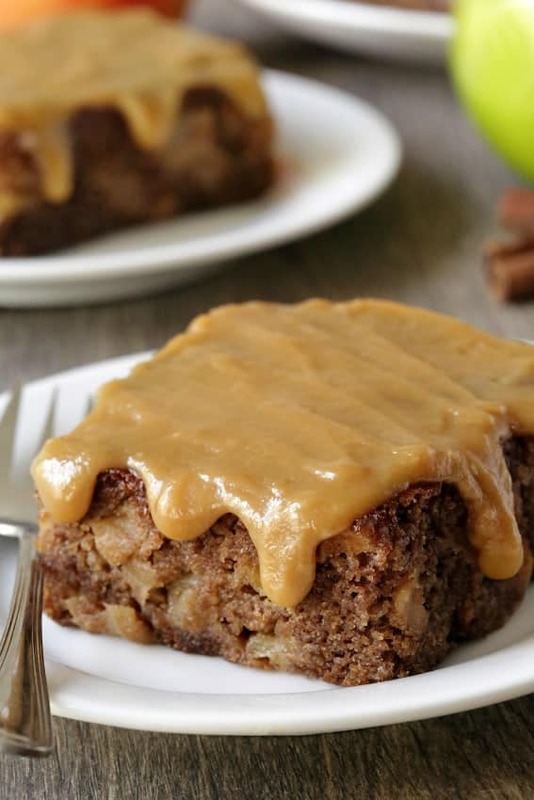 Caramel apple cake is perfectly spiced, moist and topped with a salted caramel frosting. With gluten-free option. This caramel apple cake is about as easy as it gets. In my last post, I shared a recipe for mini pumpkin cheesecakes and talked about how I like to keep things simple, especially for Thanksgiving. Layer cakes are beautiful, sure, but a layer cake is probably the last thing I want to make for Thanksgiving. I don’t know about you, but I can easily waste half an hour fussing with the frosting trying to make it look just perfect. And it never does! 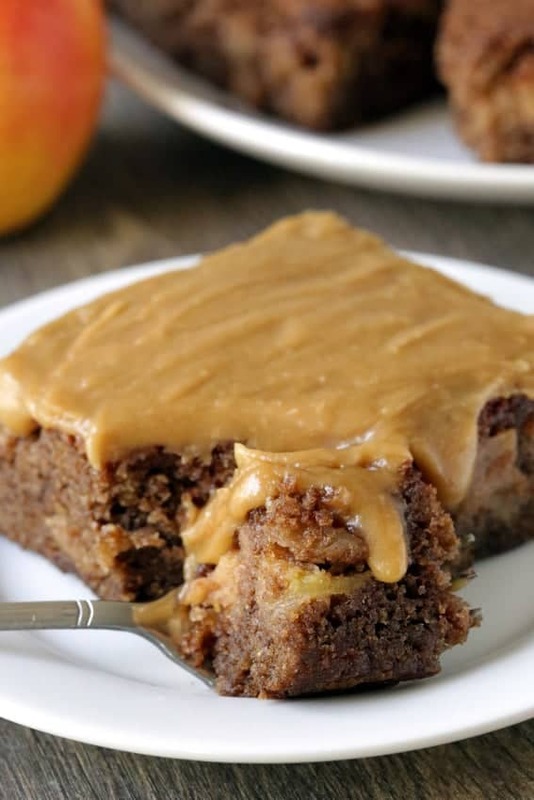 So today we’re bypassing all that with a good old 9×13 apple cake with caramel frosting. You can either use all-purpose flour or a blend of gluten-free flours listed in the recipe for a gluten-free alternative. I’ve made both versions and none of my taste testers could tell a difference between the two! 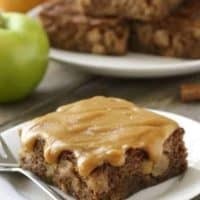 For the frosting, I used the simple caramel frosting I first posted in my caramel apple cheesecake bars. I poured on the slightly warm caramel frosting just before serving, which resulted in the droopy appearance of the frosting. If you frost the entire cake and then cut into pieces, yours won’t look like that. The frosting hardens a bit in the refrigerator but once it comes to room temperature, it softens up again. If you use the full 1/2 teaspoon salt, the frosting has this amazing salted caramel thing going on. If you don’t like your sweets salty, stick to 1/4 teaspoon salt. And if you’d rather top your cake off with caramel sauce, Jamie’s salted caramel sauce would be perfect, especially alongside some vanilla ice cream. I hope you all have a happy and delicious Thanksgiving! For more delicious gluten-free Thanksgiving desserts, check out my Gluten-Free Pumpkin Pie Streusel Bars and Gluten-Free Mini Caramel Pecan Tarts. Line a 9" x 13" baking pan with a piece of parchment paper or alternatively spray the pan with baking spray. In a medium mixing bowl, stir together the flour, 1 tablespoon cinnamon, nutmeg, baking soda, and salt. Set aside. In a large mixing bowl, stir together the brown sugar, granulated sugar, oil, eggs and vanilla until thoroughly combined. Add in the flour mixture and mix just until well combined. Place the apples in a small bowl and sprinkle the remaining 1 tablespoon granulated sugar and 1 teaspoon ground cinnamon over the apples. Stir to coat the apples in the cinnamon sugar. Fold the apples into the batter. Pour the batter into the prepared pan and bake for 33-40 minutes or until a toothpick inserted in the center comes out clean. Stir in the brown sugar and whipping cream. Once the mixture starts bubbling, stop stirring. Let the mixture come to a full boil and boil for 1 minute without stirring. Remove the pan from the heat. Stir in the vanilla, 1/4 teaspoon salt, and gradually add the powdered sugar. Whisk until the powdered sugar is fully incorporated and no lumps of sugar remain. Add the remaining 1/4 teaspoon salt, if desired. Once the cake has cooled, spread the frosting over the top and refrigerate any leftovers for up to 4 days. Let come to room temperature before serving. Hi, This recipe looks great and will try, but I wanted to get your input on what ingredients / measurements you would change to make it as a muffin. Hi, Carol! I haven’t tried them as muffins but it should work (I think) without making any changes other than the baking time. I’m not sure how long they’ll take, though. Maybe 15-20 minutes? The cake is really moist so it may take them longer than 20 minutes to fully cook. I hope you’ll enjoy them! Could that cake be any more moist? And that glaze. Swoon. These were a huge hit at a Christmas party last week. I’m going to make again but as mini cupcakes. Thanks for all the great recipes! I am going to be making this for a dinner Saturday. Baking newbie, what type of apples would you recommend? Granny Smith like a pie? Hi, Coryn! I think Granny Smith apples would be wonderful. I hope everyone enjoys it! Pecans sound like a wonderful addition, Elizabeth! I’m so glad you liked the cake! You’re welcome, Emily! Your additions sound wonderful. Let me know how you like it! Hi! This looks delicious. Do you think I could use this recipe for a bundt cake? I’m guessing I would need to increase the baking time as it will be a taller cake? Thank you! I would love to make this but I am a little confused at the sugar/brown sugar part. Is it 1 cup of brown sugar + 3/4 cup granulated sugar to total 1 3/4 cup combined for the cake itself and then 1 T sugar separately to combine with the cinnamon for the apples? I want to make sure. It sounds like a lot of sugar for one cake considering the flour is 1 3/4. That would mean it is equal parts sugar and flour, correct? If you can respond, that would be great. Thank you! Hi Kelly! I’m sorry about that. The two sugars should have been on two separate lines! It’s fixed now. Thanks for pointing that out. You use 1 cup of brown sugar and 3/4 cup of granulated sugar in the cake. Then the last 1 tbsp of granulated sugar is the for the apples. It is a lot of sugar but I actually don’t think it’s overly sweet. :) I hope you’ll enjoy it! The cake was delicious! I did try it as a bundt, but it was just too moist and fell apart. Couldn’t take it to Thanksgiving, but we enjoyed it just for ourselves! Will definitely make again as I don’t come across too many gf baking recipes that I like. I’m happy you enjoyed it! And yeah, I’ve had bad luck when converting cake recipes to bundts. I wish it were easier to do that because I have so many recipes I’d love to make in a bundt! That’s great that you’re going to make it again in a 9×13. :) Thanks for your comment! This recipe looks amazing!! Has anyone tried using Gluten Free flour (King Arthur or Bob’s Red Mill) in place of the GF Blend in this recipe? If so, did you use 1 1/2 cups, or 1 3/4 cups? I made this as a bundt cake for rosh hashanah,and it was excellent! I preheated the oven to 350 then put the cake in and baked for an hour and 10 minutes. I would recommend checking after an hour since oven temps vary. Also, I let the glaze cool for a few minutes until it thickened just a bit. It seemed to stay put on the cake better yet still had the ‘drizzle’ affect down the sides. This is a perfect fall dessert but I’m sure I’ll make it more than just once a year! So happy to hear you enjoyed this recipe, Dee Dee! Thanks for stopping by an leaving your feedback! Hi, looks like a fantastic cake. Just wondering if anyone has tried cutting back on sugar by any chance and how it turned out please..? 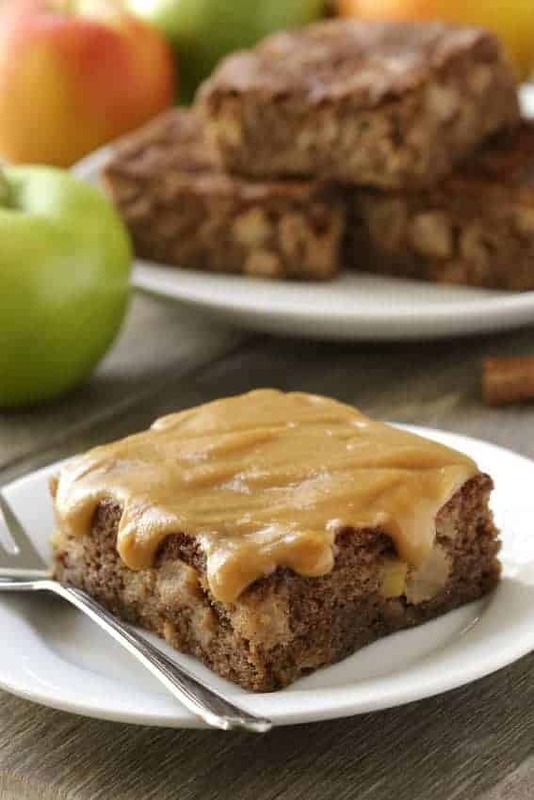 I quadrupled this recipe, used a total of 12 apples (4 granny smith, 4 honey crisp, 4 red delicious ) 3 & a half cups oil..
Also quadrupled the caramel, used evaporated milk, poured batter into two 12×18 sheet pans, cut both cakes into 3×5 pieces, took to church this morning… not one piece remained!! This Cake Is a winner for sure!! Glad to hear you enjoyed it, Felicia! Happy Baking! Delicious! I used less sugar and used a bag of caramel chips. I made an oatmeal crumble to place on top instead of the glaze. Thanks so much, Cherie! Your substitutions sound delightful! Really loved this cake for fall. I used Macintosh apples as I find Granny Smith Apples too tart and tough for baking into cakes. The frosting was very good, but very sweet. I wonder if this might work with a cream cheese frosting? I also think the cake on it’s own would be fine if you have people who can’t have too much sugar, diabetics etc..the flavor is really lovely with the cinnamon and nutmeg and the sweetness of the apples. So happy to hear you enjoyed the recipe Marcy! Thanks for stopping back to leave your feedback! Happy baking! Hi Erin! I was wondering if you have frozen this cake unfrosted. Thank you for the time you have put into your delicious recipes.